Born in South Wales in the 60s. Of Welsh/Maltese parentage, London was a destination and Art a vocation. The motorway hadn’t broken into Wales much beyond Cardiff, cars were rare, and telephones exotic. A vague awareness of Michelangelo, Leonardo, Henry Moore and popular press talk of Carl Andre's ‘Bricks’ were the art references I set off with, to study Fine Art at Cardiff and Canterbury . The most intense activities of my childhood were creating an environment in a cupboard and moving furniture around in the bedroom. Materiality and The Spacial were clearly intrinsic in my nature. Assuming Artists were ‘painters’ I fought the sculptor impulse that was innate, though unexplored. Supplementing the Colleges Art History programme with second-hand bookshops, Exhibition and Museum going and peer group discussions, I found a place within Sculpture as a discipline. Fellow students from Central School of Art in nearby London, played a lively stimulating part in this intellectual journey. Many of these peers, who have continued with their practice, I’m still in dialogue with, such as Marcus Vergette and Nicola Tassie, and some new ones such as Joel Tomlin. Whilst At college I was one of the few who extensively used mold-making and the bronze casting foundry. In the early 80’s immediately after College I moved to London to continue work. 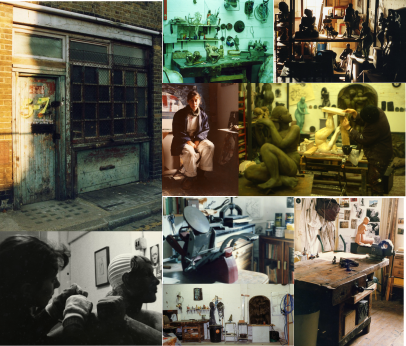 The first studio was in Redchurch Street (Having lived there as a student Marcus Vergette had recently vacated it, having been an object of great interest to the local businesses, who, at that point hadn’t been exposed to many ‘Artists’). I shared this space with contemporaries who had already been living and working in London. Mostly they were painters. Sculptors were thin on the ground. Tim Cunliffe who had studied sculpture at Canterbury was one of the few who had also moved to London, but he was turning more to Stained Glass. At this time I supported myself financially, by working with letterpress, relief block printing, serving in a second hand book- shop in Museum Street near the British Museum, and an African art and antiquities shop in Drury Lane. The Shoreditch Studios were followed by others; in Wapping, Poplar and Bow, all in the East End of London. A period of teaching Art to mature residents in Toynbee Hall, and in psychiatric day centres helped embed me in East End culture and London presented a realm of human creativity and personalities, constantly renewing itself whilst containing portals to the past. Group shows within the U.K. followed, and, as a result of having work cast while molding and finishing in the foundry on my own behalf, I was invited to work part-time with the A&A Fine Art Foundry as a freelance foundry worker. This was a fruitful time of being amongst highly skilled workers; many who also made their own work. In my time there, I helped produce casts for Galleries such as Waddington’s and the Lisson; for artists such as Barry Flannagan, A.R. Penck and Bill Turnbull, often liaising with the artists themselves. Later I worked for AB Fine Art, helping cast work for the likes of Anish Kapoor and Gavin Turk. In the 90s I was introduced to the British Art Medal Society by fellow Canterbury alumni Nicola Moss. After being commissioned to make a BAMS medal I became involved serving on their committee, mentoring New Medalists, organizing a Conference in Canterbury and running workshops. I also had the opportunity to take part in metal Casting workshops in Finland and the Czech Republic. My work has often drawn on the image of the human and the female. Whilst being interested in the subject expressed through the narrative, and its physical empathetic potential, it has also been important to engage with its historic lineage and metaphoric tendency. Dialogue with historic work, European and non-European has been part of the pleasure. Picking up threads and interest in Romanesque, African, Indian and prehistoric sculpture, and the work of artists such as – Otto Guttfriend, Giambolognia, Degas, Barlach, Fontana, Verrocchio, Gabo and Riemenschneider, reinforces the primal sophisticated nature of the activity. Nuance of balance, form, and volume, the relationship of surface and incident, the role of drawing, honed making and contextualizing are all qualities I respond to. My sculptural interests go beyond the figurative, though this is my main field of making. The artists whose work I follow tend to have a sense of material such as Eva Hesse, Richard Serra, Willard Boepple and Philida Barlow. My interest in performance and film is more academic. 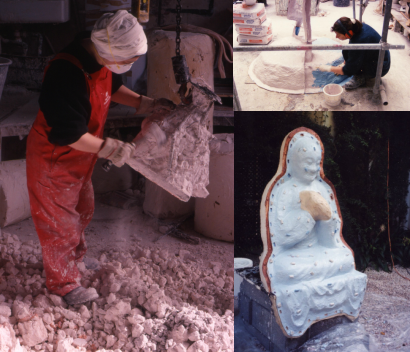 Whilst running the Foundry at the Royal College of Art I was involved in many stimulating projects such as- The Toaster project and Rose Gibbs monumental cast of a Mountain, which was filmed for the BBC British Sculpture series Romancing the Stone. I co-organized the Metaflux Platform with Dr Trish Lyons, a two-day conference that gathered together Commercial Foundries, Art School Foundries, Artists, Educators, Students, Historians, Curators and Conservators. This coincided with the Royal Academy Bronze exhibition for which I was acting as an advisor. I also collaborated with Andrew Griffiths to deliver an annual Iron Casting event with a coke fired cupola, this gave the students an opportunity to work together in a way that was not often possible whilst pursuing Post Graduate research. I have run sculpture workshops for students ranging from 4 to 70 years old and have always enjoyed finding a subject and structure for them. I have often found myself in a teaching situation, and never tire of making break-throughs in communication, and technical 'know how'. I have sometimes worked other artists such as Danuta Solowiej on a school bronze-casting project sponsored by the Worshipful Company of Founders for the City of London Festival, and with Andrew Griffiths on Iron casting workshops run by the Dartmoor Arts Summer School. Working with Rupert Harris Metal Conservation, as part of a maintenance team, an on-going programme of cleaning and repairing public sculpture in the City of London meant that by working with scaffolding, ladders, power washers and propane torches we kept the bronze monuments of figures of note and historic sculpture ‘looking good’. In late 2014 I decided to return to Wales, to live and work in Llangynog, where I look forward to consolidating the experience that I have gained since leaving thirty-five years earlier. I will re-evaluate my relationship with the culture, landscape and sounds. Wales will give me a physical and conceptual space in which use my metal casting skills while continuing to offer some free lance technical support, and, most importantly, pursue my own research and development. Over the next few years I am developing a large multi media project based on the fourth song - Glamorgan and Monmouth, in Michael Drayton’s’ 17th century poem the Poly – Olbian, and William Holes marvelous engraved illustration of the event outlined. The gathering of the English and Welsh along the banks of the River Severn in order to claim ownership of Lundy by virtue of their prowess in singing. The River Severn becomes a spandrel between the nations, displaying - Nymphs, the haughty minx-like Lundy, ‘fair, wondrous wise’ Sabrine and the overseeing Neptune. It will bring together: the visual arts, singing, poetry, story telling, film, sound, performance and mapping. It will work with issues such as ownership, nationhood, identity, unification independence and competition. It will explore, Canu Pwnc, Plygain, Marie Llwyd, Paul Robeson and the Welsh Miners trans Atlantic singing, the annual Chepstow gathering of wassailing Morris dancers and Mari Lwyd (in performative combat), and find the English equivalents. It will be an opportunity to reinterpret the historic and the emblematic and to involve contemporary artists working with the human voice and performance to evoke historic moments, and to look at identity and community.